Meng, J. and Roy, S. (2016). Study of Epithelium Barrier Functions by Real-time TER Measurement. Bio-protocol 6(10): e1815. DOI: 10.21769/BioProtoc.1815. Transepithelial Electrical Resistance (TER) measurement is a reliable and efficient method to quantify the permeability of barrier forming cells such as epithelial cells. Measuring the permeability of the epithelial cells will help the researchers to investigate the barrier function of epithelium in various infectious and inflammatory diseases. 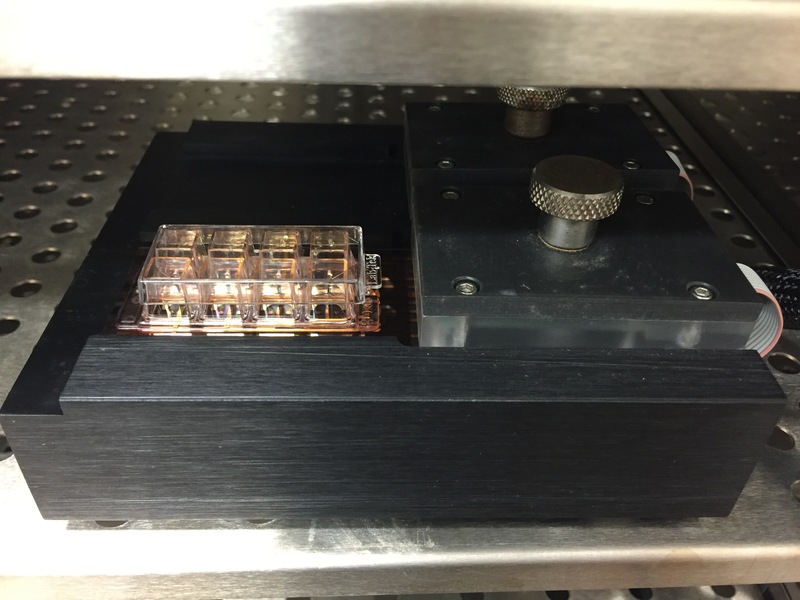 Here we provide a real-time and impedance-based approach for measuring the permeability of epithelial cell monolayer using the Electrical Cell Substrate Impedance Sensing (ECIS®) instrumentation. Note: It is also named as “Sodium chloride solution (0.9%)” on Sigma-Aldrich website. Note: Two methods are available for cleaning the electrodes in the 8W10E+ cultureware (cysteine treatment or electrical stabilization). Place 200 µl of 10 mM sterile cysteine solution to each well for 10 min. To rinse the wells, put 500 µl of sterile medium, saline or water and aspirate the liquid. Repeat the rinse step twice. Place 300 µl, 35 µg/ml collagen solution in each well and incubate at room temperature for one hour. To rinse the wells, put 500 µl of sterile medium, saline or water and aspirate the liquid. Repeat the rinse step twice. Add 300 µl, 35 µg/ml collagen solution in each well and incubate at room temperature for one hour. To rinse the wells, put 500 µl of sterile medium, saline or water and aspirate the liquid. Repeat the rinse step twice. Add 200 µl medium to each well. Place the cultureware in the ECIS Array station within the incubator (Figure 2). 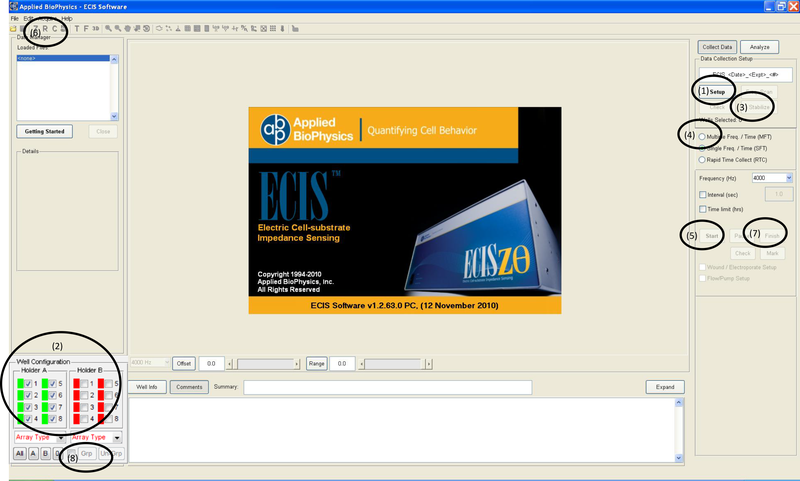 Start ECIS Zθ Software. Click the “Set up” button to check if arrays are properly connected to the system. If the array diagram in the lower left hand position of the screen turns green, the array is properly connected. Red color indicates the absence of an array or an incorrectly connected array. If the array diagram shows red, adjust the position of the cultureware slightly and click “check” to ascertain that each well of the cultureware is connected properly. Click the “Stabilize” button (Figure 3). Electrical stabilization should only be used on cell-free electrodes. After stabilization, remove the medium. Prepare single cell suspension and add 400 µl of cell suspension into each well. The number of cells inoculated in each well can range from 104 to 105, which will depend on the characteristic of cells. For the intestinal epithelial cells, 5 x 104 are usually plated in each well. After plating cells in the wells, wait 20 to 30 min before placing the array in the incubator space. Put the cultureware containing cells in the ECIS Array station and run setup procedure (1) to check that all wells are properly connected (2) as shown in Figure 3. Select “Multiple frequency” (4) and click start (5) as shown in Figure 3. The system will start to record the impedance at 11 pre-defined frequencies. Click “R” (6) and the resistance values will show up over time during the experiment. High frequency is usually used to monitor whether the cells form the confluent monolayer. 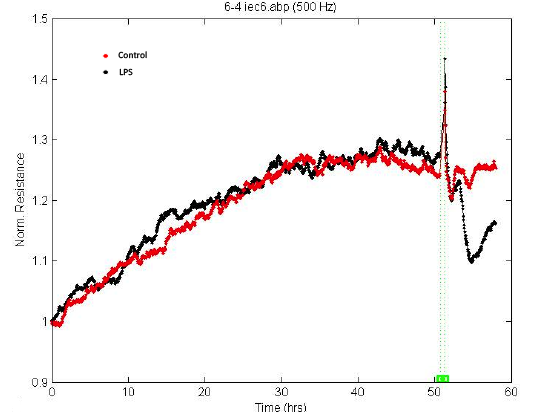 While the cells are spreading, the resistance values are increasing at 4,000 Hz as shown in Figure 4. When the cells reach confluence, the resistance curve will reach the plateau, at this point the treatment can be added to test the change of barrier function. Figure 4. The attachment and spreading behaviors of IEC-6 cell. 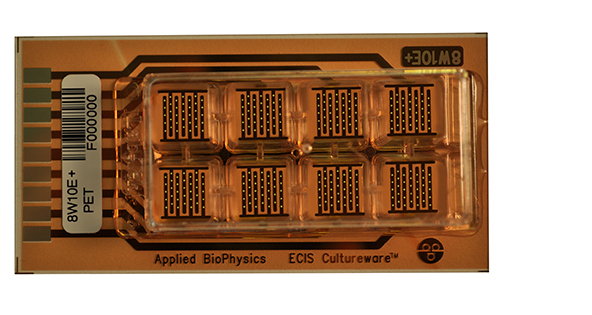 5 x 104 of IEC-6 cells were inoculated in the ECIS cultureware. The cells formed the confluent monolayer after 60 hours. At this time point the curve reached the plateau. Due to the sensitivity of the instrument to the media components, it is preferable to change media every day during the entire duration of the experiment. Click Pause and take out the cultureware. Withdraw the old medium and gently add fresh medium every day. When the cells reach confluence, withdraw 200 µl medium and gently add 200 µl of the 2x stimulus-containing medium so that the final centration is 1x. Lipopolysaccharide (LPS) with the final concentration of 1 μg/ml can be used as a positive control. At the desired time point, click Finish (7) to stop the experiment and analyze the data. Low frequency (500 Hz or 250 Hz) is usually used to monitor the barrier function of the cell monolayer. 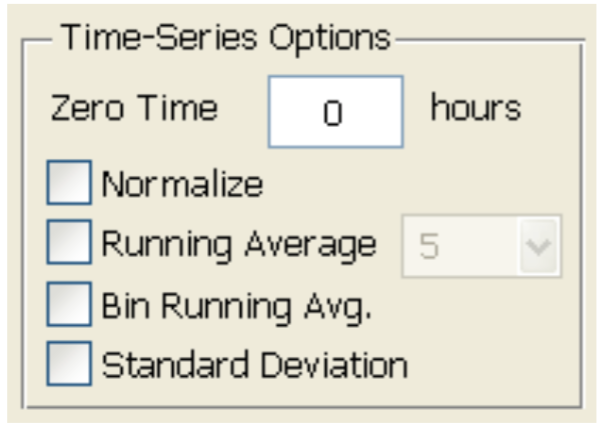 Choose the desired time point as time 0 and select “Normalize” (Figure 5). According to the product manual, for tight epithelial cells, impedance at low frequencies is more sensitive and provides a very effective measure of the layer's barrier function. The normalized resistance curve at 500 Hz is shown in Figure 6. The results indicate that LPS disrupted the barrier function of IEC-6 cells. Figure 6. Disruption of barrier function following LPS stimulation. Saline or 1 μg/ml LPS were added to the IEC-6 monolayer. The reduced resistance values indicate the disrupted barrier function. Green dash line indictes the time point when LPS was added. 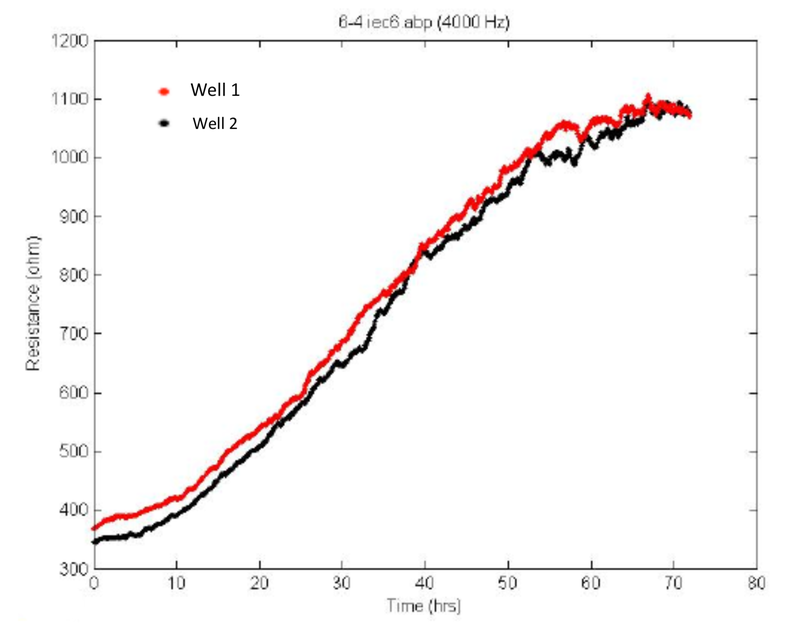 If you need to calculate the average resistance values for multiple wells, usually, each treatment was run in triplicates and the average resistance values for each treatment group can be compared using statistical analysis. Select the desired wells (2) and select “group” (8) (Figure 3). Then click . The average resistance curve with error bars will show up automatically. While cleaning and coating the cultureware, avoid using Phosphate-buffered saline (PBS) since PBS has been shown to interfere with the absorption of some proteins by the metal electrode. Cysteine is highly recommended to obtain consistent results. But if cysteine interacts with protein coatings on the electrodes, electrical stabilization is preferred. For IEC-6 cells, collagen solution was used to coat the cultureware. Other proteins such as gelatin and fibronectin can also be used according to the characteristics of different cells. The impedance recording is very sensitive to temperature change. Before taking out the cultureware from the incubator, warm up the media at 37 °C firstly. If the cultureware is not connected properly, no data will be collected. Therefore, click “check” to confirm the proper connection each time when putting the cultureware in the station. 17.5 mM acetic acid solution is prepared by diluting acetic acid with sterile distilled water (1:1,000 dilution). The collagen is dissolved in 17.5 mM acetic acid solution. The protocol had been adapted from a previously published paper (Meng et al., 2015) and the Ztheta Manual provided by the Applied Biophysics, Inc. This work was supported in part by the NIH grants RO1 DA 12104, RO1 DA 022935, RO1 DA031202, K05DA033881, P50 DA 011806 and 1R01DA034582 to S. Roy. Meng, J., Banerjee, S., Li, D., Sindberg, G. M., Wang, F., Ma, J. and Roy, S. (2015). Opioid exacerbation of gram-positive sepsis, induced by gut microbial modulation, is rescued by IL-17A neutralization. Sci Rep 5: 10918. ECIS Operation Manual Version 1.2.123: http://www.biophysics.com/publications/ECIS_Operation_Manual_v1_2_123.pdf. How to cite: Meng, J. and Roy, S. (2016). Study of Epithelium Barrier Functions by Real-time TER Measurement. Bio-protocol 6(10): e1815. DOI: 10.21769/BioProtoc.1815.